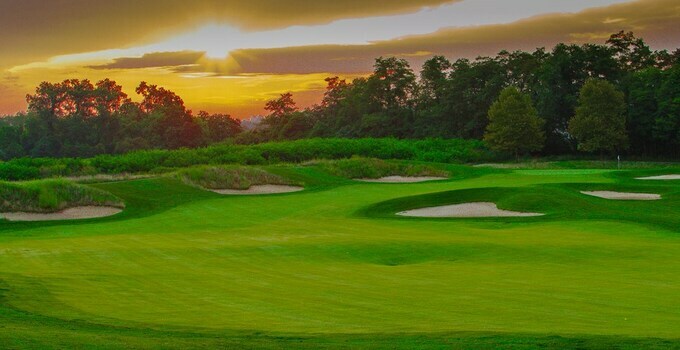 Regents’ Glen Country Club, situated within the upscale residential community of the same name in York, PA, has embarked on a six-figure bunker renovation project on its championship golf course designed by the renowned Arthur Hills. Overseen by Billy Casper Signature Club Management, more than 60 bunkers are being re-shaped, lined and filled with Augusta-white sand. These renovations come on the heels of other improvements including upgrades to the irrigation system, regrowth of under-nourished turf, new maintenance equipment and a new golf-cart fleet. The enhancements coincide with the club’s re-opening last summer upon acquisition by local businessman Rodney “Rod” Krebs and his family. It had closed in October 2015 due to financial difficulties under previous ownership. Also recipient of a major facelift is the Box Hill Mansion, built in 1929 and surrounded by English gardens and fountains. Embodying the charm of the full Regents’ Glen experience, the stately mansion’s elegant dining, pub, social areas, library, card rooms, terraced dining area and outdoor patios make it the area’s premier host of weddings, parties and other social and business functions. A fitness center, pool and nature trails round out club amenities. The RG Grill, with indoor and patio seating, recently benefitted from significant refurbishment. Social dining and the bar scene are enjoyable, and the gourmet lunch, dinner and theme menus receive rave reviews. A spectacular view of the pool makes members’ and guests’ families feel like they’re on vacation. Dozens of new members are praising Krebs’ restoration of Regents’ Glen to its former glory. The 18-hole, 6,339-yard golf course is in elite company with Bay Harbor, the Oceans Course at Half Moon Bay Ritz-Carlton, Longaberger Golf Club and other famous Hills designs. A leisurely, walkable front nine contrasts the more challenging back nine with strategically placed bunkers, lakes and well-protected greens. The course hosted several Futures Tour (currently Symetra Tour) events contested between aspiring LPGA Tour players. It is complemented by a popular practice facility that is the largest in the area. Regents’ Glen is a community staple convenient to Baltimore and Harrisburg. Single-family homes, townhouses and villas comprise the development that is already known as one of the premier housing developments in York. The new club owner’s construction company built several developments in Pennsylvania, Maryland and Virginia. Springfield Contractors, also owned by Krebs, conducted the original site work at Regents’ Glen around its opening in 1997. His family members are York-area natives who own a diversified business portfolio that has been expanded with the purchase of Regents’ Glen. In the heart of York, PA, Regents’ Glen is a community staple convenient to Baltimore and Harrisburg. The club boasts an 18-hole, 6,339-yard golf course crafted by world-renowned architect Arthur Hills, designer of famous layouts at Bay Harbor, the Oceans Course at Half Moon Bay and Longaberger Golf Club. A leisurely, walkable front nine contrasts the more challenging back nine containing strategically placed bunkers, lakes and well-protected greens. It is complemented by a popular practice facility. The course has hosted several Futures Tour (currently Symetra Tour) events contested between aspiring LPGA Tour players. The Box Hill Mansion, built in 1929, is surrounded by English gardens and fountains. Embodying the charm of the full Regents’ Glen experience, the stately mansion’s elegant dining, social areas, billiards, card rooms, terraced dining area and outdoor patios make it the area’s premier host of weddings, parties and other social and business functions. A fitness center, pool and nature trails round out club amenities.